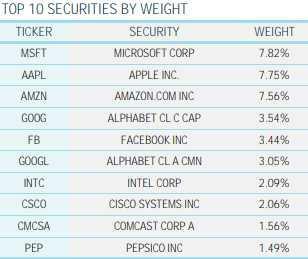 The Top 10 (9 really) Nasdaq components make up 40% of the indexes weight. We look at each one to see if they justify the Nasdaq's 60% gain over the past two years. At the moment, the Nasdaq is our primary hedge (using SQQQ). 5,150 was the top in 2000 before the great crash took it back to 1,200, a 76% drop which took many years to recover from. In fact, we only got back to 5,000 in 2016 but here we are, less than 3 years later, up another 3,000 (60%) and no, I don't think this time is like 1999 when people were throwing money at terrible stocks but there are still plenty of stocks people are throwing unrealistic amounts of money at and there WILL be a reckoning - one day. AAPL, of course, is my favorite company on the planet and $200/share is $943Bn in market cap but AAPL earned $59.5Bn last year (tax advantaged) and should make $53Bn this year for a P/E of 17.8 - still quite reasonable and a real bargain compared to MSFT. In 2016, AAPL had $215.6Bn in revenues vs $265.5Bn this year and that's just 23% revenue growth while 2016 profits were $45.6Bn and last year was $59.5Bn so $14Bn more is 30%, not 60%. I guess you can still say AAPL is undervalued but even I worry about paying 20x earnings for an electronics manufacturer which is still subject to market forces and cycles so AAPL gets a C for justifying Nasdaq gains though I'll add a + as I don't see any reason they should correct much from here. Amazon (AMZN) has taken over the Universe - or so they would have you believe but, in fact, $232.8Bn in revenues last year were less than AAPL and not even half of Walmart's (WMT) $514Bn and WMT is about 10% of all retail so AMZN is a bit under 5% - a force to be reckoned with but far from dominating retail. Growth, on the other hand, has been astounding - with 2016 sales at $136Bn so up $97Bn is 71% - right in line with the Nasdaq. Profits have exploded from $2.4Bn to $10Bn so up 316% so AMZN would get an A for justifying the Nasdaq's gains EXCEPT they are only 10% shy of $1Tn at $1,863/share so they are trading at 90 times earnings. Of course an optimist would say that, in 2016 at $500 ($241Bn) there were priced at 105x earnings so getting a bit more reasonable but still unreasonable so I'll have to give them a B - and even that is reluctant as I think 90x is ridiculous. Google (GOOG) has been on quite a tear since 2016, when they made $19.5Bn on $90.3Bn in sales. Last year, revenues were $136.8Bn (up 51%) and profits were $30.7Bn (up 57%) so good steady growth and, at $1,227, GOOG is "only" $850Bn so 27.7 times growing earnings is actually quite fair though not "too cheap" so I can't give them an A but A- seems fair for them. Facebook (FB) has been taking a lot of crap this year but that's a result of theIr success with roughly half the planet using their website. At $179, FB is only a $511Bn company so we're out of the Trillion Dollar Club now but FB's 2016 Revenues were $27.6Bn and profits were $10.2Bn while last year they hit $55.8Bn (up 102%) with $22.1Bn in profits (up 117%) and keep in mind we're talking 2018 so just 2017 in between means up 100% in two years. I give an A+ for FB, though you would think they will have to colonize another planet as they are running out of new customers on this one! Google (GOOGL) again? Don't be fooled, it's the same company being counted twice just because there are different classes of shares - that's idiotic. I'm dropping them to B for cheating! Intel (INTC) at $254Bn at $57 has more than doubled their earnings from $9.6Bn in 2016 to $21Bn last year but revenues were $59.4Bn and now $70.8Bn (up 19%). That's because 42% of their income now comes from very profitable Data Centers and look for INTC to pop today as they announced they are getting out of low-margin modem production now that QCOM and AAPL have kissed and made up as there's no point in INTC bothering if they are going to be frozen out of half the market right off the bat. You don't need to double revenues to double earnings - that puts them in the "A" category as it helps justify a lot of forward-looking enthusiasm in tech. Cisco (CSCO) is another one of my favorite companies with a $250Bn valuation at $57 on $49Bn in sales and $13Bn in earnings vs 2016s $49Bn in sales and $10.7Bn in profits (up 21.5%) so no new revenues and only a small profit improvement and a 19.2x P/E ratio is why I don't bang the table for them anymore as they've gone from $30 to $57 (up 90%) in a bit of irrational exuberance. D for CSCO! Comcast (CMCSA) - Are there any other cable companies anymore? All I know is I have XFinity WiFi and it seems to work almost everywhere I travel. $42/share is a $187Bn valuation but, as you'd expect, revenue and profit growth don't justify the stocks rise from $30 (40%) in two years. 2016 Revenues were $80.7Bn and 2018 were $94.5Bn so up 17% on that side with earnings going from $8.7Bn to $11.7Bn, a respectable 34% but not enough to make me think the Nasdaq is full of bargains but a P/E of 16 is not outrageous so let's give them a B- for the effort. Pepsi (PEP) is hardly what you think of when thinking Nasdaq stocks but it's in there at $172Bn at $122/share and they seem impressive at first glance, with profits soaring from $6.3Bn to $12.5Bn so call it 100% but it's all tax breaks and one-time gains that won't be repeated. Realistically, I'd say $8Bn is fair going forward and that's up 30% while revenues went from $63Bn to $64.6Bn - barely a gain at all. While I'm tempted to give PEP a C for this effort, they are reasonably priced at 20x current earnings and, more to the point, they illustrate the way in which many companies are simply more efficient now than they were just two years ago and able to generate more profits per Dollar in revenue - and that bodes well for the whole index as we're in the very early stages of an automation revolution. We'll give them a B as they are not a tech stock but have still been able to make great improvements. Well I'm very surprised as we're in B-B+ territory for the Top 10 so maybe we've been too harsh on the Nasdaq as it's climbed and climbed and climbed and climbed? While I don't think things are much of a bargain at this level and we're certainly cautious as we saw how fast a 22% correction hit us in the Fall, I guess things aren't all that over-priced either and we were simply a bit too pessimistic about our prospects in 2016. 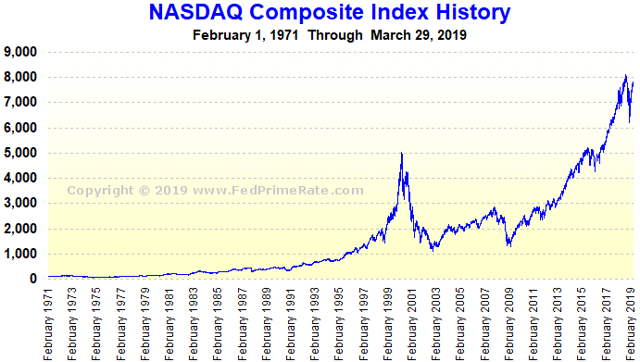 Of course, another 20% move up from here is going to need a lot more justification - but let's not just write it off as, clearly, the top 10 (9 really) stocks of the Nasdaq Composite, that make up 40% of the entire index, are able to justify the indexes 60% gain over the past couple of years. Disclosure: I am/we are long MSFT, AAPL, INTC. I wrote this article myself, and it expresses my own opinions. I am not receiving compensation for it. I have no business relationship with any company whose stock is mentioned in this article. Additional disclosure: Positions as indicated but subject to RAPIDLY change (currently mainly cash and an otherwise slightly bullish mix of long and short positions - see previous posts for other trade ideas). Positions mentioned here have been previously discussed at http://www.Philstockworld.com - a Membership site teaching winning stock, options & futures trading, portfolio management skills and income-producing strategies to investors like you.